Given my love for cookies, December is one of my favorite baking months. Pies may rule Thanksgiving, but Christmas is all about cookies. The shortbreads, the peanut butter kiss cookies, the sugar cookies, the gingerbreads . . . I love them all. I love the special red and green decorations that show up in the baking aisle, the cookie baking get togethers, and the trays of cookies shared between neighbors. 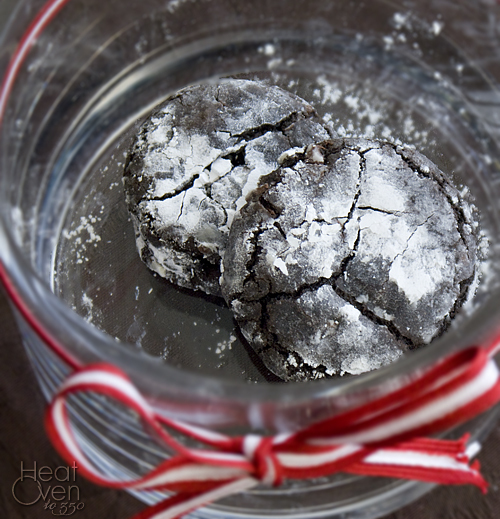 I have my favorites for this time of year, and these crinkle cookies are one of them. The dried cherries and the almond flavoring give these cookies a special flavor that is different from most crinkle cookies, and they are sturdy enough to pack well for transporting to parties or friend's houses. 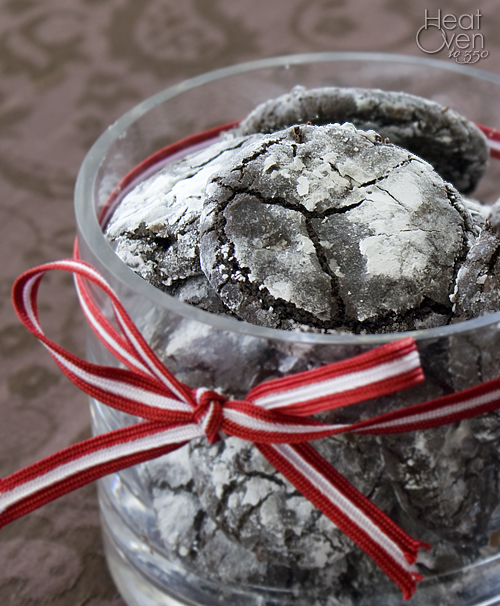 The powdered sugar layer makes them wintery and festive without requiring a lot of extra time and work. If you are looking to round out a holiday cookies tray or just want to enjoy a rich, chocolately cookie, these are perfect. In a small bowl stir together the cocoa, flour, baking powder and salt. In a large bowl with an electric mixer, mix melted butter and sugar. While mixing, add eggs one at a time, beating after each addition. Mix in vanilla and beat until smooth and creamy. Slowly add dry ingredients and mix until incorporated. Add chocolate morsels and cherries and mix until blended. Heat oven to 350 degrees. Shape dough into 1 inch balls, coat generously in powdered sugar and arrange on baking sheets 1 inch apart. Flatten slightly with a glass dipped in powdered sugar. Bake for 10-12 minutes or until tops appear cracked. Cool on sheets 2 minutes, then transfer to wire racks to cool completely. Do you think well-drained candied cherries would work? Flavor-wise, yes. I think you'd have to add more flour to get the dough firm enough since the candied cherries would add more liquid than the dried cherries. You could always add some flour, bake a test cookie and add more as needed. Let me know if you try it and how they turn out. I love the idea of the almond flavor and the cherries in these! I've never heard of adding dried cherries and almond extract to crinkle cookies, but i LOVE it! I'm totally trying this variety next year. I made a cookie this year that I think you would love- they're a cakey cocoa spice cookie with nuts and apricot preserves and a lemon glaze. I think they'd actually taste very similar to these. I would love that! Did you share the recipe on your site? You're so wonderful. Thank you! I choped up the cherries and left them to drain overnight. I added a little more flour like you suggested and they came AH-mazing. Thank you so much!